Tomatoes. Canned. | Ooh, my favorite! 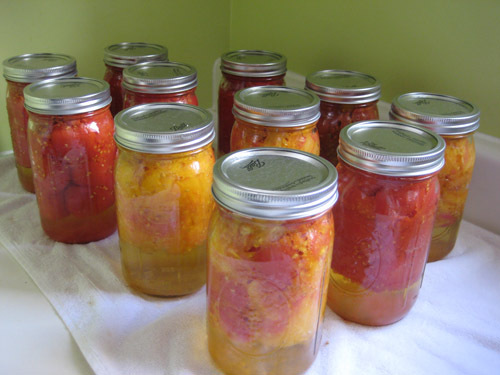 Early girl and heirloom tomatoes, canned. Bam! I did it! I dove head-first into canning this past weekend. I sort of half expected that I’d have to write the blog equivalent of a retraction, but happily there’ll be none of that today…and I am freakin’ ecstatic! There were no tears, but plenty of sweat and blood if you count the tomato seeds stuck to the arm (and maybe even a few stuck in the hair). While it was great fun it was a lot of work; I’m getting ready for bed right at this moment. I need a weekend from my weekend, so while I recuperate I’ll share my finished product above. Hope you all had a great weekend. Monday’s already over, dare I say this week is going to fly by?